Includes signage at your hole, one golfer, recognition at awards ceremony and all GWBAA publications. Option to have table at your hole to greet players. Includes signage at bag drop station and table to greet golfers, one golfer, recognition at awards ceremony and all GWBAA publications. Sponsor volunteer must be provided to greet players. Includes signage at competition hole, one golfer, recognition at awards ceremony and all GWBAA publications. Includes signage at driving range, one golfer, recognition at awards ceremony and all GWBAA publications. Includes four golfers, company name and logo on all golf carts during tournament, recognition at awards ceremony and all GWBAA publications. Sponsor logo appears on goodie bag given to each golfer and recognition at award ceremony. Sponsor receives four golfer spots. Includes four golfers, signage at lunch, recognition at awards ceremony and all GWBAA publications. Includes four golfers, company name and logo on pint glasses distributes to all golfers, recogniton at awards ceremony and all GWBAA publications. Due to the impending weather forecast, the GWBAA 14th Annual Golf Tournament will now be held on September 27, 2018. 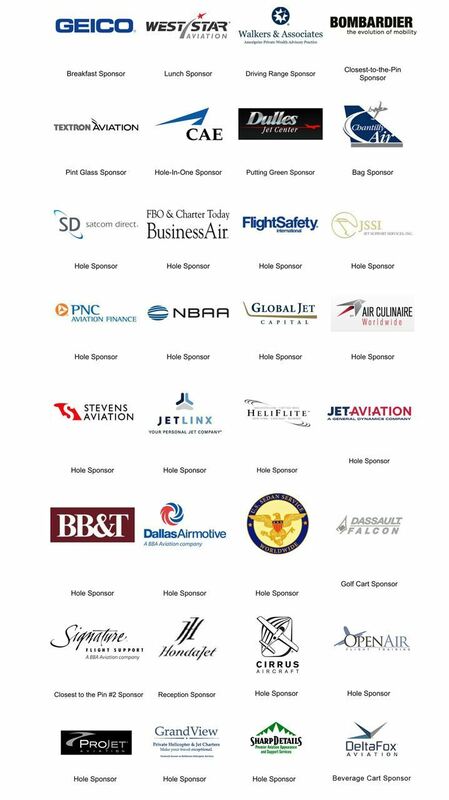 The day will help support the Aero Club of Washington and the Corporate Angel Network. The event will include a 4-person scramble with a shotgun start of 8AM, hot breakfast, and awards luncheon and receptions following the golf.